On Wednesday, August 26, I traveled to the Greenville Associate Reformed Presbytery Church were Outreach North American was holding a seminary on poverty with Randy Nabors and Will Broadus. Nabors is pastor-emeritus of New City Fellowship in Chattanooga, Tennessee and Urban and Mercy Ministries Coordinator for Mission to North America for the Presbyterian Church in America. He grew up in poverty in Newark, New Jersey and has extensive experience in cross-cultural ministry and ministry to the poor. Broadus, an African-American Baptist pastor, grew up in poverty on the Westside of Greenville. He became a Christian at 14, and the story of his pilgrimage is riveting. Having served in East Asia as missionaries, Will and his wife, Becca, moved back to Greenville to plant Reconcile Community Church, which he envisions as a cross-cultural ministry to the poor. Why Am I Interested in a Seminar on Poverty? When I saw this seminar on poverty, I wanted to attend it. I was raised in Eloise, Florida, a small citrus-worker and migrant-worker community in Central Florida. Interestingly, I did not know we were poor until I was 12. That year I was bussed to school in Winter Haven, and I discovered my world was larger than Eloise and felt the sting of being thought of as second-class. My wife was raised in deep poverty. She was one of four children of a single-mom in Richmond, Virginia As a small child, because her mother was ill for a protracted time, she lived in an orphanage. When her mother recovered, she reclaimed her children. They then lived in federally subsidized apartments. At 15, Erlene dropped out of school, lied about her age, got a job as a waitress, and helped her older sister to graduate from high school and her mother to care for her two younger siblings. My wife is amazing. She tells stories of attending church via the bus ministry of a Baptist church when she was five. At 19, she became a Christian. With the help of her church and Christian friends, she was able to get her GED and attend Bible School and college. I found her in college. She sat on the front row and was one of my students. I married her three years later. My career was ministry to small town Associate Reformed Presbyterian congregations, and most of the time I was the church planter and solo pastor. Quickly, I discovered the people to whom I was able to minister where people with an educational background similar to mine. Some of them were financially affluent and some were not, but all of them reflected educational accomplishment. At Fuller Church Growth Seminars, I learned this was called the Homogeneous Unit Principle. Understanding the principle, I was uncomfortable with it and did not see it squaring with the church in the Book of Acts. I was plagued with my inability to reach those who were different. I was never able to fully solve the puzzle of racial and socio-economic blending. So, those who can are a captivating mystery to me. Well, what did I learn at this seminary on poverty which was sponsored by Outreach North America? One, I learned not many Associate Reformed Presbyterians are interested in a seminar on poverty. 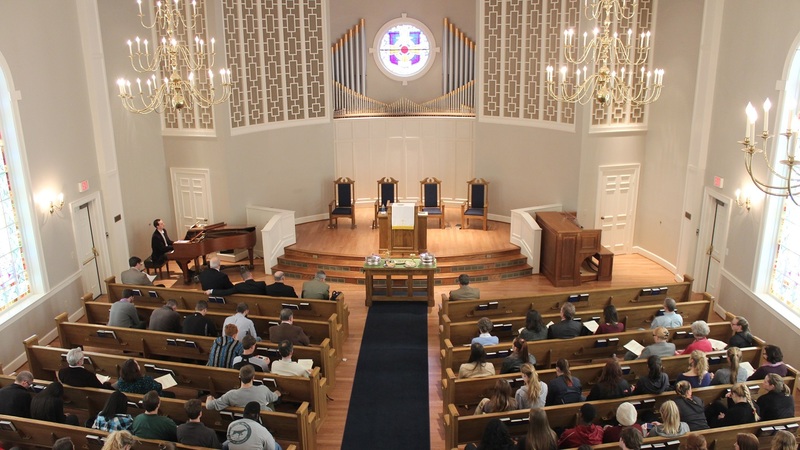 Besides Outreach North America people, people from the Greenville Associate Reformed Presbyterian Church, there were not many Associate Reformed Presbyterians present. This is not a statement of criticism; it is an observation of the makeup of the audience. Also, after speaking with a number of the participants, I do not think many of them have a personal experience with poverty. Once again, this is not a criticism; it is an observation. Two, when dealing with words like “justice,” “mercy,” “social responsibly” and other hot button words, clear definitions are necessary in order to prevent people from talking at and past each other. Three, I greatly appreciated Nabors and Broadus’ emphasis on preaching the gospel to conversion and diligent discipleship of believers. If I understand what they were saying, poverty is a sign of God’s judgment. As I heard them, discipleship in the local church leads people out of the life-destroying lifestyles that produce and continue generational poverty. In other words, a form of Christianity which does not transform is not authentic. Four, I learned the best way to deal with poverty is by planting Bible-believing, Bible-teaching, and Bible-discipling congregations in poor communities. Since poverty is a sign of God’s judgment (Deuteronomy 14.4-5), the seed of poverty is spiritual. Government, therefore, is unable to deal with the root issue of poverty. (Actually, government institutionalizes, industrializes, and promotes poverty to a political end.) A local congregation which is Bible-believing, Bible-teaching, and Bible discipling has the transformational tools which enable the poor to overcome poverty. In the words of Randy Nabors, “The local church is God’s vehicle for social change.” That is to say, the gospel transforms people! Five, the question, “Why do Presbyterians have difficulty with planting congregations among the poor?” was answered by Randy Nabors. He answered it is because Presbyterian church planters expect to be paid. Well, church planting is hard — and extraordinarily hard among the poor. It calls for indomitable commitment to call and vision. It asks, “What price are you willing to pay? Are you willing to be a tentmaker in order to see your vision accomplished? Are you willing to invest 30 years of your life and count it joy?” Indeed, we look at someone like Randy Nabors who informs us his church has 1100 member and a multi-million dollar budget, and fail to hear him when he says it took him 36 years! Six, I learned church planting which reaches the poor must take the office of deacon seriously to the point of professionalizing it. It has been my observation that Presbyterians do not know what to do with the office of deacon. In our churches, deacons are the greeters, the ushers, the ones who count the offerings, the ones who frame the budget and argue with the elders over it, the ones who oversee the cleaning and repairs of the church building and the maintenance of the grounds, the ones who open and close the doors on Sunday, the ones who maintain the Mercy Fund, and, lest I forget, the ones who make the coffee and put out the donuts. All of which is the trivialization of the office of deacon. In a congregation which ministers to the poor, the office of deacon is of paramount importance. When the poor attend church, they come with many and various needs and problems to be resolved. Deacons who cannot attend to such needs are a waste of effort. When the poor attend church, they attend with their children who are ignorant of church etiquette (as are the parents), and I can assure you the blending of behaviors between non-churched young people, Christian School young people, and homeschool young people is maddeningly complex. Deacons who cannot attend to such needs are a waste of effort. When the poor come to church and a trained and involved board of deacons is not in place to assist the pastor and elders, the work of the congregation is paralyzed. When Jesus called Peter, James, and John, He called them to leave their boats and follow Him (Luke 5.1-11); after his healing, the demonic of the country of the Gadarenes asked Jesus if he could follow him, and Jesus said, “Return to your own house, and tell what great things God has done for you” (Luke 8.28-39); and, when Jesus called Paul, He sent him as “a chosen vessel . . . to bear [His] name before Gentiles, kings, and the children of Israel.” (Acts 9.15). Certainly, callings are different, and a servant is only responsible to his own master (Romans 14.4). I am no man’s master. However, I do admire those who are called to minister in places of poverty in Jesus’ name. They go to rescue people like my wife and I were. Excellent and spot on. We don’t engage with the poor and under educated because we speak a different language. Thank you pastor. The amazing thing about the Wesleyan revivals in England and American: men who were well educated learned how to speak to the poor and under-educated. They even created “Sunday Schools” in order to teach young people and others how to read. How will we meet the challenge today? I don’t know. We as Presbyterians can assist the poor in many ways. We do not necessarily have to work in a soup kitchen or a homeless shelter. John Calvin was an advocate for educating the poor, so they could learn to read. He felt that if you could read you could lift yourself out of poverty and the obvious if you could read then you would be able to read the Bible. The Calvinistic tradition is one of well-educated individuals. There are more colleges, universities and medical facilities started by Presbyterians than any other denomination. There are more elected officials in Washington, DC than any other denomination. Donald Trump, Ronald Reagan, Woodrow Wilson and others were baptized in the Presbyterian church. The current governor of South Carolina is Presbyterian (ARP.) John Witherspoon was the only minister of the gospel to sign the Declaration of Independence. The ARP church has a history of keeping to themselves. ARP’s have a reputation of not getting involved in social justice issues and dealing the poor. If the ARP church would show more civic responsibility, they would increase their presence in the community and that will be an avenue to increase membership. Bill, “we as Presbyterians” can’t do a thing about poverty. Generally speaking, “we” have abandoned the God of the Bible. The PCUSA (as a denomination) no longer believes in sin, the Bible, or the conversion of sinners to Christ. As you read my article, Bill, you simply ignored the salient emphasis of Nabors. He emphasized the planting of Bible-believing, Bible-preaching, and Bible-discipling congregations. Poverty, he said, was the judgment of God and not a lack of resources. Nabors said, “The local church is God’s vehicle for social change.” Bill, soup kitchens, education, and political rhetoric about “the least of these” are not replacement-saviors for Jesus Christ, who said, “Repent or perish!” (Luke 13:1-5; Matthew 23.34-39) and “I am the way and the truth and the life. No one comes to the Father except through me” (John 14.6). Bill, the problem with all of us is our unwillingness to be identified with Jesus who said the proof of who He is (and those who followed Him) is the good news being preached to the poor, and blessed are those who are not offended by this (Matthew 11.4-6). BTW, Bill, I must take exception with you in your reference to John Calvin. He did not believe a person could “lift yourself out of poverty.” His emphasis was conversion. Learning to read the Bible brings a person in contact with God’s acts of redemption. And, of course, the ability to read also has many other salubrious effects. I’m happily sharing your article with the men of our church in the hope they’ll be blessed by it. I especially like item # 6 regarding the diaconate. Thank you for writing. Good to hear from you again. And thanks for making use of the article.